Looking for help finding your fitness motivation? You'll love the Fit Armadillo December 2018 Fitness Challenge. The fun starts Monday, December 10, 2018 and runs (literally - I want to help you start running even if it's just a little bit) through Monday, December 31, 2018. This year's challenge has a running theme (the fitness challenge hashtag is #DecembertoRunmember), but beginners are welcome! By joining the fitness challenge your goal will be to get moving for a minimum of 15 minutes or 1 mile for a minimum of 12 days during the 22 days of the challenge. What's a running focused challenge without some race bling? The 1st 25 participants to submit proof that they've moved for 15 minutes or 1 mile for 12 days will earn a sparkly FINISHER'S ornament* that can spend the off season as a magnet (check it out HERE around the 4:40 minute mark if you'd like to avoid some of my silliness). Be sure to register for the challenge HERE. 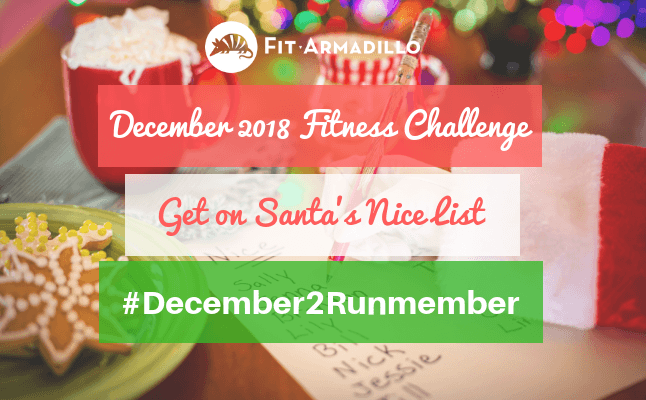 Prepare for the challenge by following Fit Armadillo on social media ( Instagram, Twitter, and/or Facebook ) and sharing a post with the challenge hashtag #December2Runmember so we know you are joining us. Get moving with us for at least 15 minutes or 1 mile for as many days as you can. Complete 12 days and you'll have completed the challenge! You'll get a daily email with running tips, inspiration, and extra challenges to help you stay motivated. What's coming up at Fit Armadillo in 2019? January 2019 ​The Fit Fifteen podcast show comes back. Be sure to subscribe on iTunes or wherever you listen to podcasts by searching for "The Fit Fifteen." January 14th Start of the 2019 Drop 2 Sizes Fitness Challenge! Learn more about the 10 week online small group fitness program HERE. Sign up for updates like early bird registration and free workshops about the challenge HERE. I'll be opening my schedule for private running coaching clients and offering some additional running programing. Head HERE to get on the running email list for updates.